International Women’s Day is still important. March 8th has only lost its relevance if we use it as a day to promote more privileges for ourselves. But by using it as a day to stand up for women around the world, who are living in poverty and oppression, it is hugely relevant. Apparently kittens always attract lots of views on youtube. 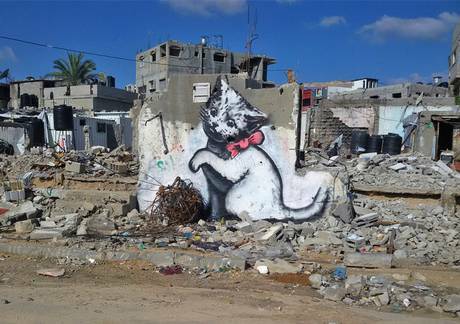 That’s why street artist Banksy did this artwork in Gaza – a cute kitten playing with the debris of bombing. He commented that it was the only way to get attention for the suffering of people caught in the on-going conflict. So now the kitten’s got your attention, how do we get action for the suffering of millions of women and girls in poverty? One way is to have an international day devoted to women – and it’s coming up this Sunday the 8th. International Women’s Day. Do we still need such a day? Does it discriminate against men? And will the day achieve anything for girls and women on all the other days of 2105? Well, let’s think about Mother’s Day. It’s a short time set aside to celebrate mums but that does not mean we ignore our mothers the rest of the year. Or wedding anniversaries – try telling your partner that it’s unnecessary to celebrate your anniversary as it doesn’t achieve anything any more. Special days and holidays are reminders of achievement, sacrifice, love and commitment. Maybe International Women’s Day makes some uncomfortable because it’s a reminder of the continuing low status of women in so many places. Women are more affected by poverty than men and have less stable economic circumstances. All round the world women suffered most in the economic crisis of 2008 – they were the most vulnerable to losing their jobs or having pay cuts. It is their jobs that have been lost in the public service and their children who have been affected by health and education cuts. In the UK, USA and Australia, if present rates of change continue, it will take another 75 years for women to achieve equal pay. That means not my daughter, or her daughter but my daughter’s grand-daughter may get rewarded fairly for her contribution to society. Women who have babies never make up the pay gap. And you might say that is OK because life is about more than money, but there needs to be more discussion on International Women’s Day about the economic value of care work, parenting and voluntary work. And men should join that debate. Because the truth is that women perform 66 per cent of the world’s work and produce 50 per cent of its food, but earn only 10 per cent of its income and own one per cent of its property. In the developing world, women plus poverty can be a deadly equation. The maternal health targets of Millennium Development Goal 5 will fall short – 50% of pregnant women still miss out on adequate health care; and we will not reach the headline target of a 75% drop in maternal deaths (it’s 45%). I could go on with stories of how women are treated in many places – widows are mis-treated, girls are forced into early marriage, women are cheated out of their inheritance and women who don’t have children are still blamed as failures. So don’t tell me that a day for women isn’t needed. Oddny Gunmaer helps women and children affected by conflict to meet basic needs, prevent them being trafficked or exploited, and care for them in crisis situations. So what does she want for women caught in crisis? Check out Partners Relief and Development founded by Oddy and Steve Gunmaer. Like w2wglobal facebook page – it tells you more about issues facing women and how faith intersects with those issues. Spend less time watching youtube videos of kittens! I’m fully agree with this sentence “…using the day as a day to stand up for women around the world, who are living in poverty and oppression, it is a day of great relevance” In Africa, especially in my country the DR Congo, women and girls are suffering, not only forced for the early marriage but most of them are living in extreme poverty, their still the first victim of the war that affected the country for more than 20 years, but also victim of the local culture. In our organization, we are prepare to meet church leaders and women together this Sunday, to speak about how to help vulnerable women and also how to prevent violence from local culture and other kind against women. Please stand in prayer with us, after this meeting I can share photo and stories from Goma – DR Congo. Next PostNext Poverty, chastity, obedience – a winning formula?